You want to secure more office building cleaning contracts, but where do you even begin? These are just a few of the questions that might be running through your mind. Well take a deep breath because you are about to learn a few tips and tricks of the commercial cleaning contract game that will help you sell better than ever before. In order to efficiently spend your time chasing contracts, you must know who your target market is. For example, if you prefer to focus on smaller businesses then you should seek out businesses who employ fewer than 500 workers. Most small businesses are located in shared facilities meaning you must figure out if the facility provides cleaning services to the tenants or if the individual tenants must provide their own cleaning services. Once you know the answer you can better know who your target is and what to prepare to impress them. If your target is a facility manager or owner, then having a larger crew to clean the entire building quickly after work hours may be a priority to them. If your target is a small business owner, lower cost may be more of a priority to them. You have to consider your target in every step of the way and consistently acknowledge what their expressed needs and wants are in order to seal the deal. There are a few ways to get in front of businesses in your target market. One is the timeless practice of referrals, always encourage your happy clients to refer you to others who may need your services. Don’t fret if you are just starting out, there are other ways to meet your prospective clients. One very successful way of marketing yourself and making connections is through networking. Most local business communities have free or paid networking groups for all industries to participate in. There are also numerous opportunities to meet new customers through local charity events, sponsorship programs, and introducing yourself and handing a business card out through your everyday activities. Make a goal to hand out three business cards a day and you are sure to see new business. Internet marketing, social media advertising, and having a great website always helps to generate new leads as well. Closing the deal is the most important and difficult part of the selling process. In order to do this, you need to know how to sell yourself as well as your company’s strengths. 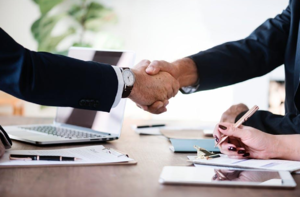 However, that is not the most important part of the deal, listening to your potential client and asking questions about their wants and needs is typically what makes or breaks a deal. There are plenty of competent companies to cover the basics of a facility cleaning contract, but no one wants to hear the same pitch that three other businesses gave them. When targeting an office building full of diverse businesses or multiple small businesses under one roof, the number one thing that will make you stand out is how well you listen and adjust your pitch to what your potential client prioritizes most from a facility cleaning company. Another way to stand out is to offer solutions and ideas to improve the cleanliness of the office building based on your own observations and where you see the current company is slacking. If you want to land that office building cleaning contract, here’s how you can make it happen. 1) Decide who you want your target market to be. 2) Find ways to connect with new targets whether it be networking events, social media, or handing the office manager at your dentist’s office your card. 3) Sell yourself – but remember who you’re selling to. Remember – a generic pitch will seem generic to your potential client.